At first I wanted to give myself the ol’ facepalm in a fit of frustration, but then I realized that my readership as a whole is extremely fitting to me and my lifestyle—it’s balanced. So, I decided to please both sides of the poll by creating one of each recipe. This week, I’m bringing this Shrimp Fajita Salad With Chipotle Vinaigrette to the table. And it is goo-ood. Next week, I’m hoping to succeed at creating one hell of an Instant Pot recipe with shrimp to satisfy the other side of the poll. Tangy red onions, crisp bell peppers, juicy tomatoes, perfectly seasoned shrimp… this recipe brings everything you love about fajitas to your bowl of salad for a healthy and substantial meal option, whether it be lunch or dinner. If you aren’t following a strict pescetarian diet, feel free to substitute the shrimp for chicken. You could also toss in some crunchy seasoned chipotle chickpeas and save any leftovers for this bomb taco grain bowl or these vegetarian tacos. The vinaigrette is also optional, technically. In my mind it’s a necessity, but you can use any salad dressing you damn well please. This dressing blends the smokiness from chipotle hot sauce and the sweetness from pure maple syrup to give you a flavor-packed dressing you’ll want to drizzle over everything. It’s inspired by a tostada salad that I love digging into at a local bar and grill. The more I mowed down that salad, the more I felt I needed to crack the code on that dressing. I’m not pompous enough to say I nailed it, but I think I got pretty damn close. This would also act as a fab dressing for my Southwestern Sweet Potato Quinoa Burger. 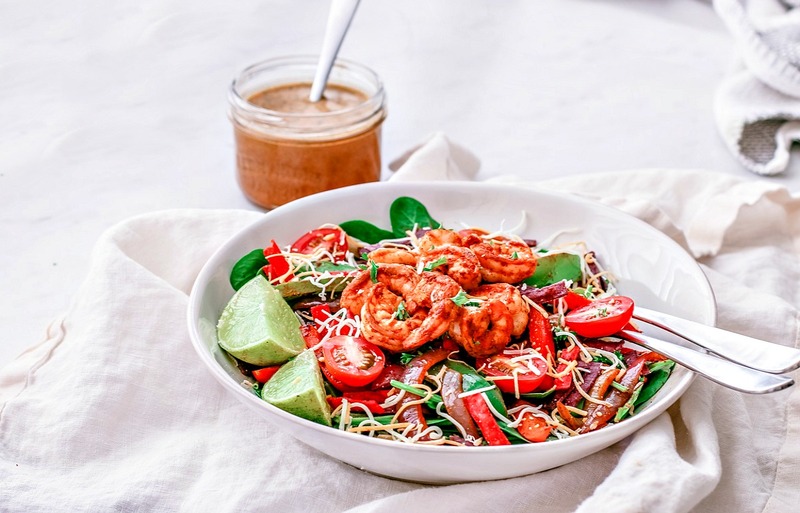 Bring your love of fajitas to your salad bowl with this Shrimp Fajita Salad With Chipotle Vinaigrette. It's smokey, sweet, spicy, and downright delish. Place all of the ingredients for the vinaigrette into a blender and blend until smooth. If not using a blender, you can add everything to a bowl and whisk it thoroughly until everything is blended. Place the onions, peppers, and cleaned shrimp in a bowl. Drizzle with olive oil and add the cumin, garlic powder, chili powder, smoked paprika, ground coriander (if using), and salt and pepper. Toss to combine. Heat a skillet over moderate heat. Add the peppers and onions; leave the shrimp out for now since they don't take as long to cook. Sauté the peppers and onions for about 2 minutes. Add the shrimp and sauté everything for another 3 minutes. Remove from heat and set aside. Prep your salad bowl by adding the spinach, grape tomatoes, cheese, and crunchy tortilla strips. Top the salad with the warm shrimp and veggies, and drizzle chipotle dressing over it. Toss to combine, give it a spritz of lime juice, and dig in! Going to make this tmrw, I just want to point out the tomatoes ans cheese are not in the ingredients list and therefore I didn't buy them. I will have to run out tmrw. Hi Becky, The cheese was in the ingredients list (shredded cheese), but the tomatoes were missing. Thanks for pointing that out! I've added them. Hope you enjoy! What a gorgeous and bright dish! This salad needs to happen in my kitchen soon! I have a ton of shrimp in my freezer without a plan. I know sad right?! Looks like they have a plan now and I’m only missing the chipotle sauce. Haha, I'm so glad you now have a plan for that shrimp! Happy to help get that plan in motion ;) Keep me posted, ok? This salad sounds super flavorful, especially that vinaigrette! *drools* I want to put that vinaigrette on everything! I wish I could chow down on this salad like RIGHT NOW! Thanks, Britt! Trust me, I do put that vinaigrette on everything. Haha. I have yet to grow tired of it! I think I'll trust you and make this dressing instead of any other damn one I'd like! The chipotle would be amazing with the shrimp - I can't wait to give this recipe a go! I love the dressing with all the smokey chipotley. Smokey is one of my favourite flavours. I think it might be a Russian thing - we eat a lot of smoked fish there. Your suggestions on using chicken or chickpeas are also spot on. I have not tried making shrimp in IP so I am really looking forward to your creation next week! Wow! I've been craving ALL things shrimp lately, so thank you for another delicious way to eat it ! That chipolte vinaigrette is calling my name. What a color! You're so welcome, Tracy! I hope you love this salad as much as I do. We're actually having it tonight, lol. This salad sounds amazing! That chipotle vinaigrette has all the big, amazing flavors I love and I'm loving how fresh and light this salad sounds. Thanks, Amy! Sometimes a big fat salad is just what's needed. What a vibrant salad! I need a bowl of this in front of me to start thinking spring. The chipotle vinaigrette sounds so flavorful and I bet it would be fantastic on an array of salads, or even as a marinade this summer! Thanks, Amanda! This salad totally reminded me that spring is just around the corner, and I am *so* looking forward to all of the colorful recipes to come. Perfect balance seems like a great idea to me. I love the colors in this, it looks amazing. Your pictures are so beautiful, thanks for sharing your recipe. Thanks, Tina! I'm glad you find this recipe enticing. This looks so light and healthy AND delicious! And that chipotle dressing- omg. I love how shrimp can be hot or cold but is always delicious! Thanks, Sarah! Honestly yeah, this salad is great warm or chilled. That's the beauty of it. Shrimp is magical! We love shrimp. That chipotle/lime combo is awesome. We love food with a kick, and this salad is the perfect "all in one meal". I would throw this in a wrap and make lunch too. Oh man Dana this sounds incredible! I've been in a bit of a rut dressing wise lately and this Chipotle Vinaigrette sounds like just what I need to shake this up around here. I also enjoy shrimp on occasion and love the way you've treated them here. I would love a big bowl of this for lunch. Beautiful recipe! Thanks Justine! Ugh, I hear you. Making salad dressing is fab and all, but when you get tired of your usual it can leave you scratching your head. That dressing sounds like a flavor bomb and something I could pretty much put on anything -- Lordy! Shrimp fajitas are always fun -- and making a salad of it makes it an everyday treat. Your photos are lovely, too. Makes me want to jump into my kitchen! Thanks Lisa! A flavor bomb indeed - and yessss. it's so so versatile. Great for a marinade and post-grill sauce! I always have a batch of this stuff in my fridge. Firstly your photos are GORGEOUS! Secondly this sounds like a delicious combo!! Can't wait to try it! Thanks so much, Chris! I hope you love it. Definitely keep me posted. Chipotle makes everything better! My family would love this salad. Agreed! That smokiness is everything. I usually have steak fajitas but these shrimp fajitas sound divine! Haha, you know, it took me ages to even try a streak fajita when I was eating beef. I agree, shrimp is where it's at!